Rush hour, Thursday afternoon found me standing on the Toronto subway heading south toward King Station holding a large cheese platter. 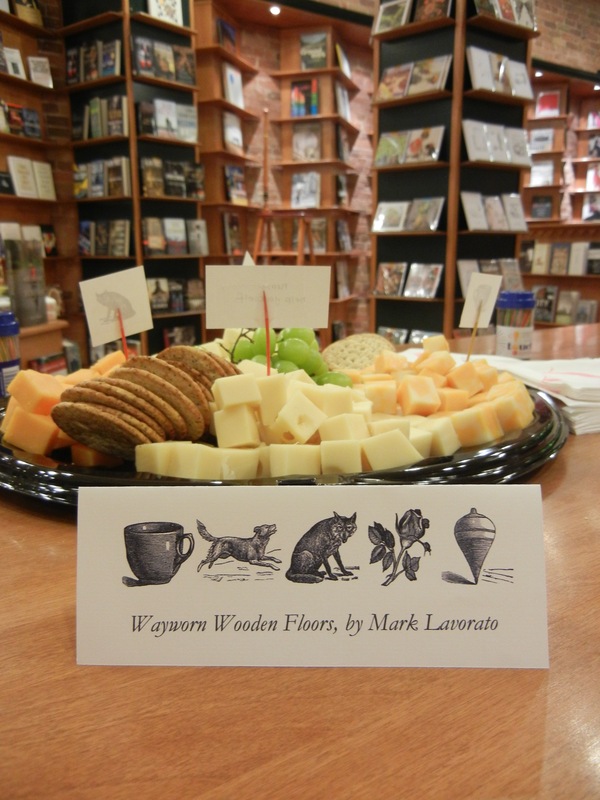 I was on my way to the launch of Wayworn Wooden Floors, a first collection of poetry by novelist Mark Lavorato. We had divvied up the duties beforehand: Mark was drinks; I was food. Having decided on a cheese platter and some grapes, I was now feebly trying to balance my load as the subway rushed southward, carrying me and hundreds of Toronto commuters to our final destinations. 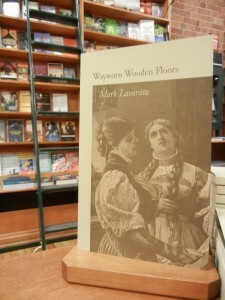 Launching Wayworn Wooden Floors at Nicholas Hoare Books. That is perhaps one thing you wouldn’t expect from a cheese platter: it is incredibly heavy. It probably didn’t help that I was already laden with materials for the launch. I was carrying three bags, draped over my shoulders and arms: bookmarks and review copies; platters, napkins, and toothpicks; and two large bunches of grapes. Upon exiting the subway I had a short walk down Victoria Street to Front, where I would find Nicholas Hoare Books at number 45. Of course, Thursday was also the peak of the record-breaking heat wave we had last week, so about halfway to Nicholas Hoare I very nearly considered giving up. Under the strain of the cheese and the heat, the promise of poetry seemed much less alluring than it had before. But I persevered. That is perhaps one of the greatest attributes of a publishing intern: perseverance, even against the burdens of a cheese platter and extreme heat. 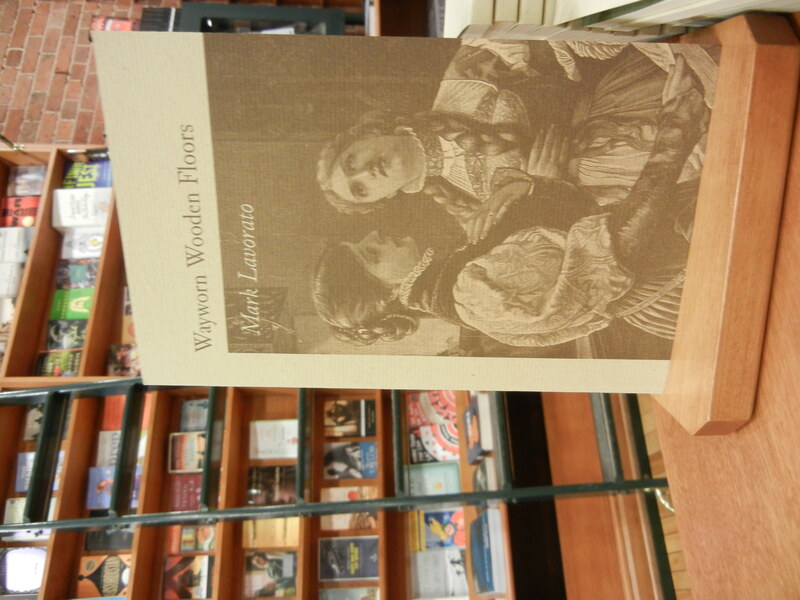 When I arrived at the delightful bookshop at 45 Front Street East, Mark Lavorato had beaten me there. Both of us were overheated and out of breath from the walk to the shop, but happy to finally be meeting, we shook hands. 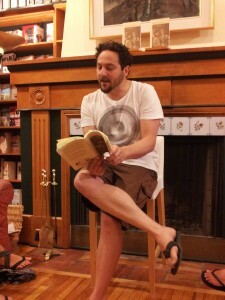 Mark reads from his collection. And thank goodness that it was. As guests began to arrive and mingle, I was certainly glad for the cool air and comfortable atmosphere of Nicholas Hoare Books. 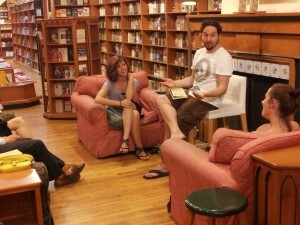 Speaking with Carolyn, we discussed the merits of an independent bookstore like Nicholas Hoare. 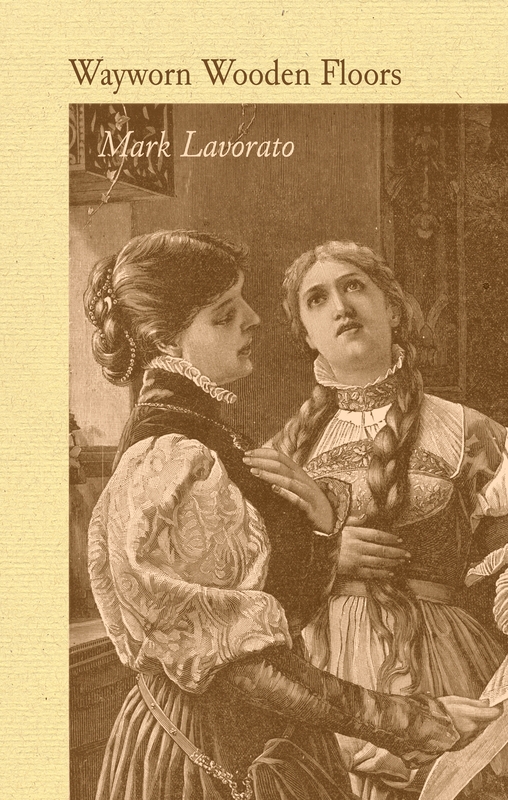 “I liked your poems,” she told Mark. “Good!” I said. “Tell everyone you know!” Carolyn smiled and said that she would. At Nicholas Hoare, she told us, the staff make recommendations to the customers. When a customer returns after reading a book that was suggested to them, they tell the employees what they thought of it. The staff can then recommend another book, and another. And isn’t this how buying books is meant to be? Books are a personal medium, and the experience of choosing and reading books should be personal as well. Wayworn Wooden Floors, set up and ready for signing. As we mingled among the high, wooden bookcases of Nicholas Hoare eating cheese and grapes, it began to get dark outside. We made our way to the comfortable chairs gathered around the fireplace just as the incredible heat outside broke and thunder began to rumble. The first poem Mark read, “Sierra de Chuacús,” was punctuated by ominous grumbles of thunder outside. Even so, it was comforting to be inside as the storm began, settling into the lovely comfortable couches with friends and a little bit of poetry. having wormed its way in from the ceiling. Even though it seems logical to assume that everything goes to cold, that everything in this life is slowly slowing down, trees are an exception. Trees, Mark explained, are ever expanding. The image of a tree thriving and reclaiming an abandoned human space is a powerful one for him. Mark answers questions at the end of the reading. Even so, some things inevitably must go to cold. As the reading wound down, we all clapped and congratulated Mark on the publication of his first collection of poems. 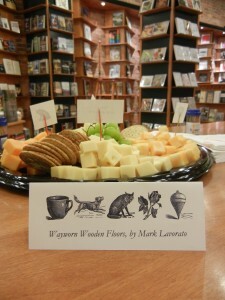 Standing and spreading out again, guests munched on grapes as Mark signed a copies of his book. At the end of the night we dashed through the rain to a pub down the street, where we settled into new conversations and discoveries over some of Toronto’s finest beers. Thank you to everyone who came out to join us Thursday night. 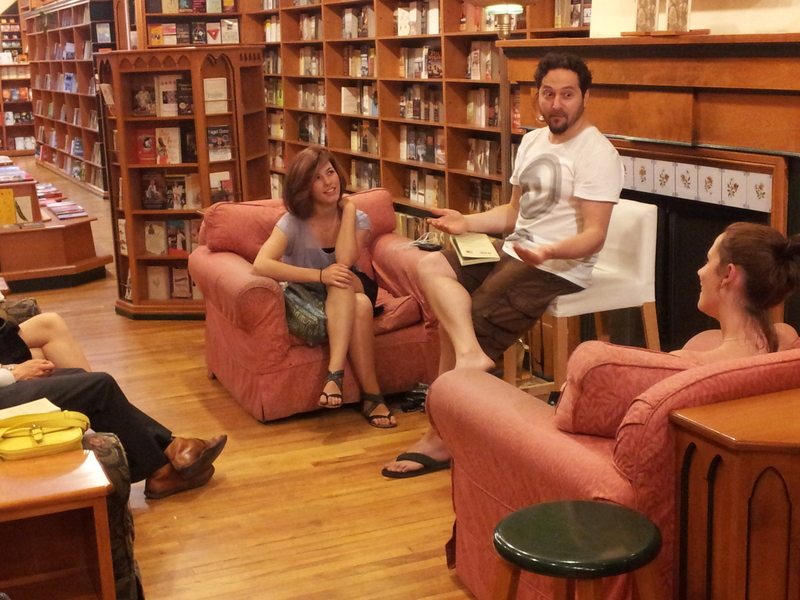 A special thank you to Evan Munday of Coach House Books, who provided invaluable insight on publicizing the event. We were also especially pleased when he made an appearance at the launch—even with the awful weather! A special personal thank you to Joanna, a very good friend, who travelled a very great distance, to be at the launch. This entry was posted in Letters from the Porcupette (the Intern's Blog) and tagged mark lavorato, nicholas hoare, nicholas hoare books, The Porcupine's Quill, wayworn wooden floors. Bookmark the permalink. nice blog! I’m looking forward to reading more of Mark’s work. …. And what a great venue… ! A wonderful reading – I have the collection and enjoy each poem for different reasons. I agree with Laurie, above, truly a great venue! So nice to meet Kate from PQ and Evan from Coach House Books as well – really lovely event with wonderful people and quality poetry! It was lovely to meet you as well, Lauren. It was so nice to have everyone out for the event. And thank you, Laurie, for your kind words! Nicholas Hoare Books is a beautiful bookstore!